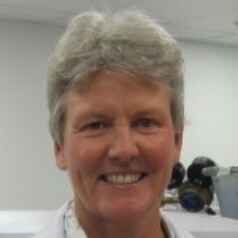 Senior Research Fellow Charlotte Allen joined the Central Analytical Facility (CARF) of the Institute for Future Environments (IFE) in 2013 after 21 years in the Research School of Earth Sciences at the Australian National University. Her academic affiliation is with EEBS (Earth Environmental and Biological Sciences). A geologist by training, Dr Allen’s expertise is U-Pb dating of minerals in order to determine the age of rocks. Currently she is the Research Fellow-Analytical overseeing laboratories/instruments/technicians associated with the chemical analyses of organic and inorganic materials, as gases, liquids and solids. The main focus of her research is improving the accuracy and breadth of application of Laser Ablation Inductively Coupled Mass Spectroscopy, a process by which solids are ablated with an ultraviolet laser and the finely ablated particles are introduced to the ICP so that almost all elements of the periodic table can be quantified if an adequate standard is available. Charlotte has geology degrees from the following institutions: A.B. Princeton University, MSc from University of Oregon and PhD from Virginia Tech.